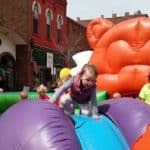 Downtown Winona was filled with laughing kids, inflatable slides, honking horns, and lots of trucks to touch, as hundreds gathered in the streets for Touch a Truck and Play Streets on Saturday. Katie and her husband Ben Freitag had tried to bring their daughter to Touch A Truck last year, but she was a bit young for the honking and it was too hot of a day for them to stay long. Although Mae Belle didn’t need it this time, the event included a quiet time where there was no honking for sensitive ears. “She’s old enough now to enjoy the jumping thing,” Katie said with a laugh.